Enzyme modified white cheese (EMWC) was produced to use as flavouring ingredient. White cheese curd coupled with low fat was hydrolysed using combination of proteinases/peptidase to produce a range of proteolysed products followed by lipolysis. The results revealed that lowering pH 5.6 known to impart flavour strength of cheese. The inclusion of enzyme preparations significantly elevated free amino acids and free fatty acids. Developed EMWC had relatively higher levels of volatiles and improved sensory characteristics including less negative attributes such as, astringent, bitter, pungent, rancid, smoky, and more positive attributes, such as the strength of buttery, sweaty, caramel and nutty notes. Spray-dried EMWC powders had low moisture content and water activity values whereas, scanning electron micrographs showed spherical with a uniform distribution and large microparticles size. Because consumers like low fat products with cheese flavour, EMWCs are important products. 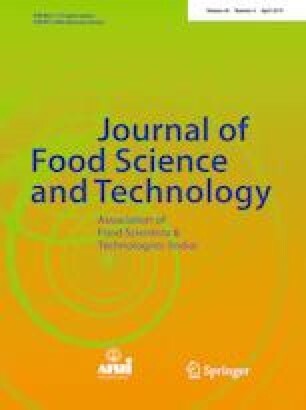 Thus, process demonstrates the potential to be a cost-effective to produce EMWC flavour as ingredient and may suited to the products in which added. The online version of this article ( https://doi.org/10.1007/s13197-018-3526-y) contains supplementary material, which is available to authorized users. This work was supported by China Scholarship Council, the National Natural Science Support of China (No. 31872905) and the National key research and development program of the 13th five years plan of China (2018YFD0400604) are acknowledged for financial support.